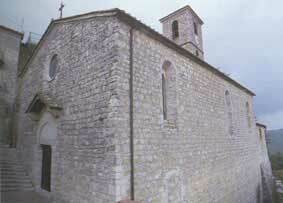 The Pieve dedicated to Saints Vincent and Anastasio, has a bell tower with two sets of windows with one opening. Built by the Aldobrandeschi (XIII° century) it has roman-gothic windows, travertine ashlars and walls built in rows. On the lunetta of the travertine facade, between the patron Saints, there is an Aldobrandeschi lion. Inside, a painting of the Rosario attributed to Francesco Vanni.